Paramount, widescreen 2.35:1/16x9, languages: English DD 5.1 [CC] & Dolby Surround, French Dolby Surround, subtitles: English, single side-dual layer, 17 chapters, rated R, 116 min., $29.99, street date 12/14/99. Directed by Simon West. Starring John Travolta, Madeleine Stowe, James Cromwell, Timothy Hutton, Clarence Williams III, James Woods. In a world where nobody asks and nobody tells, where the Army likes to keep its secrets buried and its dirty laundry unaired, the daughter of a popular general is found brutally murdered and no one wants to touch the case. But certain secrets cannot remain hidden forever when a tenacious investigator begins digging for answers only to find much more than he bargained for. When warrant officer Paul Brenner (Travolta), a top investigator from the Army's Criminal Investigation Division, is assigned to look into the murder of Captain Elisabeth Campbell (Stefanson), he inadvertently uncovers a scandal of immense proportions. Armed with the power to arrest any military person -- whatever the rank -- anywhere in the world, Brenner is determined to solve the crime, no matter where his pursuit leads, even if the clues point to his hero, General "Fighting Joe" Campbell (Cromwell). Known for his leadership and valor during wartime, the General is also recognized as a man of honor and integrity, the main contender for a vice presidential nomination in the upcoming elections. He is a public man with a very private life. Campbell's daughter was the pride of Fort MacCallum, a poster girl for the military - beautiful, smart, a superior officer. When she is found bound and dead in the middle of a training field, the authorities fear the worst and team Brenner with another CID veteran, Sara Sunhill (Stowe). Sunhill and Brenner have met before, a lifetime ago, and now, in the midst of the biggest case of their careers, they must also examine their own life choices. With the help of Colonel Kent (Hutton), Fort MacCallum's Provost Marshall and an old friend of Brenner's, the duo begin building a profile of their victim. As details about Elisabeth Campbell's private life are unearthed, no one on the base escapes suspicion. The suspects range from the General himself to his adjutant, Colonel Fowler (Williams), a faithful colleague and trusted family friend; to Colonel Moore (Woods), Elisabeth's mentor and commanding officer; to several of the enlisted men on base and even a deputy within the local sheriff's department. But as the investigators move dangerously close to the truth, they find a web of lies and deceit that threatens to destroy an entire code of honor. As I write this, it's December 30 1999. Some say the world will end tomorrow night. One sign this might be true: Paramount have released an actual special edition DVD. Of all the studios, Paramount have the worst record in this regard. A few of their DVDs contain audio commentaries, and many have trailers, but none qualified as an actual special edition. They also never released a special edition laserdisc. As such, it's great that they're finally getting with the program. But the movie in question - The General's Daughter - makes for an awfully odd first choice from the home of Apocalypse Now, Star Trek, Indiana Jones and The Godfather. Not that TGD is a terrible movie. It's not, but it's not very good, either. It's another in a long line of fairly lurid and tawdry murder mysteries. TGD managed to keep me interested, but I can't say I was on the edge of my seat at any point. It's kind of an odd mystery in that even though we have two different investigators - Paul Brenner (John Travolta) and Sara Sunhill (Madeline Stowe), there's not a whole lot they do to directly motivate the story. They seem to just wander around and randomly discover bits and pieces. Characters confess all sorts of details to them, but usually for little reason; they just eyeball people the right way and out comes the dirt! Though they're in much of the story, Travolta and Stowe make for very insubstantial presences here. Their acting isn't bad, but the characters just don't stand out very well. A fine supporting cast backs them up nicely, though. I'm in the bag for James Cromwell, so I was happy to see him, and Clarence Williams III maintains a gruff and threatening presence. Timothy Hutton seemed a little over his head, but James Woods provides his usual smarminess with a touch of softness as well. You know, I wish I had more to say about The General's Daughter, but the movie was so ordinary that I just can't think of other comments to make. It's a decent film, one that may be overly slick at times but still seems reasonably compelling and entertaining. Nonetheless, it's also pretty forgettable. TGD offers one of the sharpest DVD images I've ever seen. No matter how wide a shot may be, everything seems crisp and detailed. Moire effects and jagged edges crop up on extremely infrequent occasions. The print used appeared clean and flawless; I noted no grain, dirt, scratches, marks or speckles. TGD maintains a fairly limited palette for the most part and sticks to Army drabs and earth tones. Still, the colors appear rich and perfectly rendered and when brighter hues appear they really shine. Watch the early banquet scene; even the red wine in the glasses and the small ribbons worn by some of the officers look sumptuous. Black levels appear appropriately deep, and though shadows seem a little heavy at times, they still look generally natural and accurate. The few flaws I mentioned kept TGD from being an "A+", but it was a close call; this DVD looks wonderful. And it sounds pretty good, too! TGD presents a nice Dolby Digital 5.1 mix. The soundfield seems well-defined and broad, with good use of the surrounds. The stereo effects from the front dominate and are nicely spaced, with little of the nasty "speaker-specific" quality that mars some mixes. The surrounds fill out the audio nicely and demonstrate enough split usage to maintain a fairly realistic depth. Quality of the sound also seems solid. Dialogue appeared natural and clean and never lacked intelligibility. The music maintains an impressive richness and depth and displays solid dynamic range, and the effects appear clear and realistic and lack distortion. All in all, it's a fine mix. As I mentioned at the start of my review, The General's Daughter DVD offers that rarest of animal: a special edition from Paramount. In fact, one could easily argue that this is their first special edition, since they'd never presented anything more substantial than an audio commentary. TGD doesn't go way beyond that standard, but it includes enough extras to definitely earn its "special edition" status. First up is an audio commentary from director Simon West. It reminded me strongly of Chris Columbus' track for Mrs. Doubtfire. Both men seemed well-prepared for their commentaries and actually appeared to be working from scripted notes; West's remarks are definitely not extemporaneous, and that's fine with me. Too many commentators simply ramble on and on and their discussions become dull. While West spends a little too much time on the technical nuts and bolts, at least all of his statements are thought out and coherent, and he adds a lot of useful information to my knowledge of the film. Unfortunately, West's track resembles Columbus' in a negative way as well: it's very brief. Large gaps appear during the commentary; I'd estimate West actually speaks for about 40 percent of the movie. That's an awful lot of dead air and the spaces get pretty frustrating. As such, while West offers some good data, the track as a whole is difficult to navigate; keep your remote handy if you listen to it. "Behind the Secrets" is a featurette about TGD that runs for a little less than 20 minutes. It's clearly a promotional piece; as such, it does a competent but superficial job of discussing the making of the movie. This is the kind of program you see on HBO between features. It's okay but not terribly interesting. The DVD includes four deleted scenes; in total, these last about 10 minutes. Most of these are extended character pieces that shed a little more light on the different people; while interesting, they aren't missed in the final film. The final scene offers an alternate ending, which, had it been used, revealed that the general's daughter was actually a man! Okay - I just made that up. Actually, the alternate take just extends and makes more explicit the movie's current ending; we learn more concretely what happens with Stowe and Travolta. The filmmakers made the right choice when they left this one on the cutting room floor. Finally, the DVD presents two trailers for The General's Daughter. One is the theatrical trailer, which the other is a teaser. Both are decent but unspectacular. While it doesn't actually qualify as a supplement, one very pleasant surprise about this DVD concerns its use of subtitles. Not only does the film itself offer subtitles, but so do the featurette and the deleted scenes - in both English and French, no less! Considering that some DVDs don't even bother with subtitles during the feature, this is a pretty thoughtful addition. And a logical one, too; if those who need them are going to watch the movie, they'll want to view the supplements as well, but they generally are excluded from that because of lack of text support. Kudos to Paramount for this extra effort. I certainly applaud Paramount for finally doing a solid job on a DVD and I hope this care extends to future releases. However, that doesn't mean you should rush out and buy a copy of The General's Daughter on DVD. It's a mildly provocative and entertaining movie, and the disc offers fantastic picture and sound plus some fine supplements. Still, the ordinariness of the film causes me to lack enthusiasm for the DVD. It's worth a rental, though. Official Site--Contains the requisite movie information, plus downloadable stills, interviews, trailer, screensavers, and a game. James Berardinelli's ReelViews--"As far as mystery/thrillers go, The General's Daughter supplies what most viewers want and expect from this kind of motion picture." 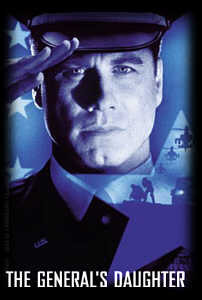 Mr. Showbiz Celebrities: John Travolta--An excellent source for profie and credits. E! Online: James Cromwell--Contains brief bio and credits. Movie Music U.K.--A full review of the original score soundtrack composed by James Burwell: "Despite the complexities of Burwell's writing and the intelligently unsettling atmosphere created by the music, all the musical restraint shown here tends to become a little wearisome by the end of the CD." Amazon.com--Available to purchase are the DVD at special discount, the paperback by Nelson Demille, and the original score soundtrack composed by Carter Burwell.